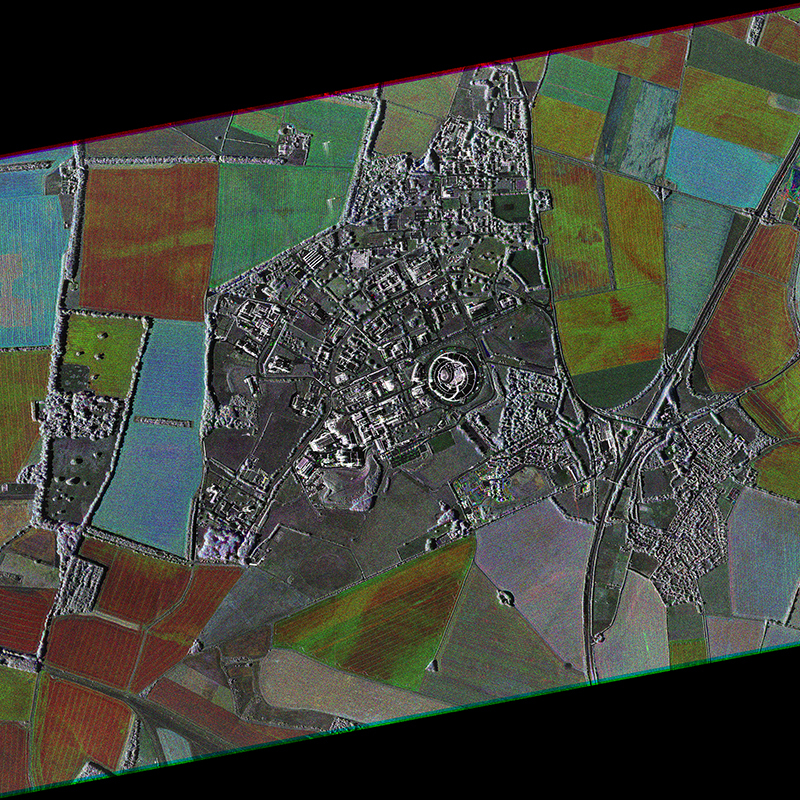 "Data stack of three TerraSAR-X Staring SpotLight images of Harwell, Great Britain, acquired in July and August 2013. Clearly visible in the centre of the image is the distinctive round dome of the Diamond Light Source, the world‘s largest synchrotron. The high resolution and enhanced radiometric quality of the new imaging mode makes many details visible: such as the distinct buildings, road networks including roundabouts and even vegetation such as trees and bushes as well as foot paths in the fields. The colours indicate changes between the acquisition dates. With the new Staring SpotLight imaging mode that provides 25cm data TerraSAR-X now delivers the highest resolution commercial SAR imagery available on the market. The new Staring SpotLight mode allows an identification of even small-scaled objects and an easier interpretation of SAR imagery by revealing crucial details. This can facilitate the identification of determining features of e.g. vehicles, vessels or airplanes."